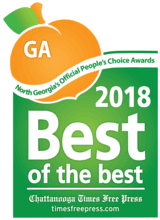 We are excited to announce that we were chosen as The North Georgia Best of the Best for 2018 by the Chattanooga Times Free Press. This is the 8th straight year we have won in the Assisted Living category. We so proud of this award and want to thank the voting public for the honor! Thanks for choosing Rosewood Retirement Community as the Best of the Best!